It’s still February and we’ve got tadpoles! The spawn was from next door’s pond, as we’ve not had any for three years, and it’s in aquatic pots to keep the newts away, but we’re going to have to get the tadpoles out quickly or they’ll be eating each other. I’m fascinated to be able to see in the photo how little they look like tadpoles at this stage: they’re too flat, except for one or two where you can see the bulge of the head. The stuff they are resting on looks like stones here, but it’s actually the circular blobs of jelly from which they emerged, which are bigger than they were when the tadpoles were still inside them. We had a day of sunshine today, so the spring flowers were out too, plus several bees. 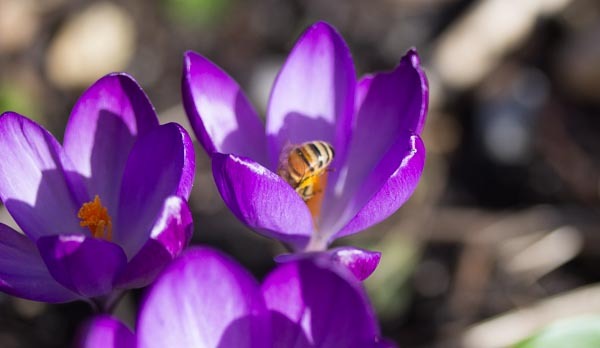 I’m guessing this is a honey bee on the crocus. There were at least three buff-tailed bumble-bees around, too, but I didn’t get a shot of any of them. 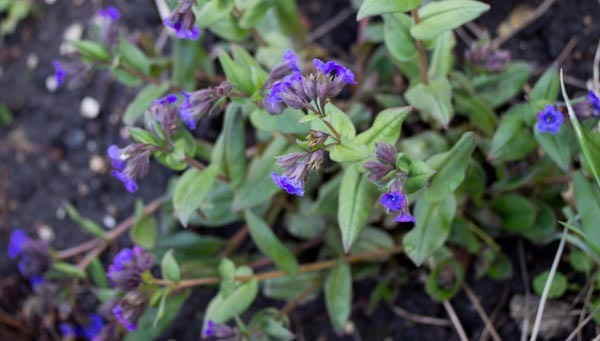 The plant above is a good early nectar plant to have in the garden for bees: lungwort (pulmonaria). This is one called ‘Blue Ensign’ and it’s a really good blue. The wild version is also very pretty: it’s got spotted leaves and the flowers fade from blue to pink (or is it the other way round?) and both colours are visible at once. Having some plants for early nectar in your garden is very important for the early bees and butterflies which get tempted out by warm weather, so do make sure you’ve got some. As well as crocus and lungwort, you can try primroses, hellebores, and mahonia (all of which are in flower in my garden at the moment). Mahonia is a small bush, but the flowers are very highly scented and a real treat when there’s not much else. You can also – if you dare – try dandelion and lesser celandine, but they both spread uncontrollably, so don’t blame me if you end up with more than you want! As an active member of the Dorset Branch of Butterfly Conservation, one of the things I do sometimes is attend events to represent the charity. Today’s event was an open garden in Dorchester, one of the many that open in aid of the “National Garden Scheme”, under which gardens open to raise money for charities such as MacMillan Cancer Support. Unfortunately, the weather was not helpful: dull and cold, and there had been problems with the publicity, meaning that only not many people turned up. Two couples, however, came and talked to us, and with one of them about to start planning a new and large garden, our being able to supply information on butterfly and moth friendly gardening was very timely. Our hostess, Heather was very kind, and we were well supplied with tea and cake (thanks, Viv), so sitting in a warm conservatory talking about butterflies was not too hard a way to spend the afternoon. 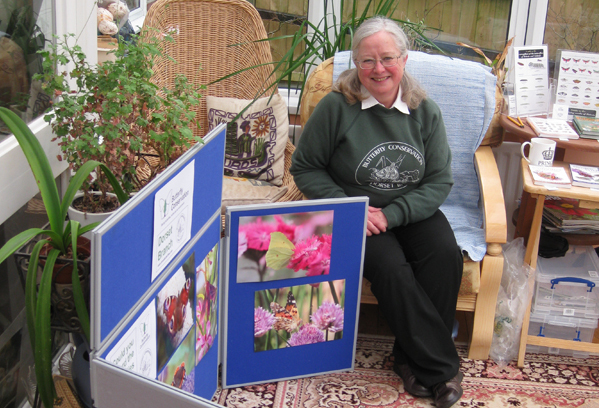 Heather is opening her garden at 113 Bridport Road, Dorchester, several more times during the year – see the National Garden Scheme for details.